And the some construct the stone of a dry river bed, and are used as an open-air bath in nature. 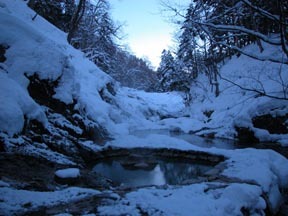 [ the Yu-yanbetsu river (mind of river where hot spring gushes) right bank which flows out of Mt. Upepesanke ] [ the flow out of a hot spring ]On the other hand, the only flow out of the left bank is kanno one, and the fountainhead close to the size 20 calls it an enough.It is a hot spring of rich efficacy which is used for a hot-spring cure from the time of the spring quality and the meiji last stage when a pouring gate makes a turn-into-solid-mass geto and Iwama consider like a sinter cone, and is said "To have ridden, to have come, and to have walked and returned to the door. "If a hot-spring cure is carried out enjoying eight bath tabs for the hot spring which actually gets warm well and gets warm this much, walking indeed and returning will also give a nod of assent.It is also the hot spring decorated with Tori of eye Mr. Tadanori Matsuda 2500 hot spring.Kawayu circulation is good and Mt.Upepesanke mountain climbing which a long ridgeline follows is also recommended. 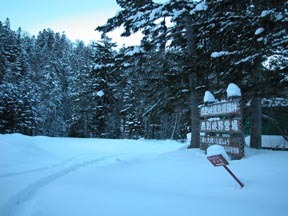 an Ezo deer fox ten and a weasel - fish owl Ezo raccoon dog salamander and a bear are not seen The kanno is a feeding area and several Ezo deer were coming in winter. The east ridgeline where three peaks stand in a row across this Mine was a beautiful mountain like the Great Wall.I was sorry for the view for which the nearness of the Mt.Nipesotsu which confronts each other should be pressed not to see [ but ].The east and west of course thyme are only 5 hours. They are a pick-up good and an important point inquiry to east / the west trailhead. 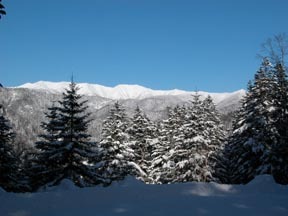 Mountain-climbing information is -> here 100 peaks and spring Japan. The hot spring of the deer of a severe winter term and a summer are small presents. It is a pleasure unique to this stage to supply snow to two hot hot spring tubs among four bathtubs. The kanno which a color tells efficacy "hot spring of a Bishamon"
Yu-yanbetsu river "hot spring of a Pira"
A Pira is Ainu language and is the mind under a cliff. 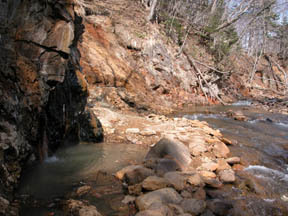 Although it is concentrating under the Shikaribetsu valley dams, such as a Penichika, the hot spring of a Makupeka is located in about 2 km of upper stream bifurcation in Rinkan about 100 m in the inner part of the left and a hut.However, there is no bathtub, the stone dammed up and it entered at last. An immovable hot spring : gastroenteropathy, the conjunctivitis, a burn, a skin disease, etc. 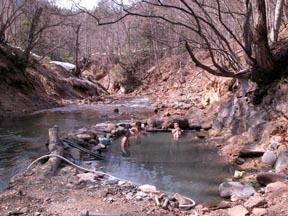 Oguro's hot spring : asthma, bronchitis, a liver gallbladder disease, etc. The hot spring in Ebisu : motor dysfunction, a stiff neck, muscular pain, etc. 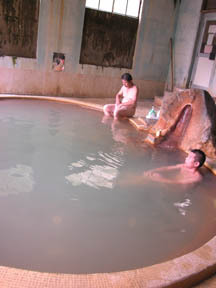 The hot spring of a Bishamon : an iron deficiency anemia, gout, diabetes, etc. The hot spring of a cloth bag : high blood pressure, cardiopathy, etc. Hot spring of the goddess of eloquence, music, and wisdom : a gynecological disorder, a lustrous skin action, etc. The hot spring of a Jyurou : hemorrhoids, the rheumatism, menopausal disorders, etc. The hot spring of a Fukuroku : oversensitivity to cold, chronic constipation, diabetes, etc. A Yu-yanbetsu Kawano hot spring, no charge.The local volunteer cleaned up frequently and has managed.